Swapping old-fashioned light bulbs for modern energy-efficient ones, upgrading decades-old heating and air-conditioning systems and arranging offices to take advantage of sunlight seem like mundane tasks. But they can spur dramatic change. Landlords and businesses across Canada’s Greater Toronto Area took such measures to see who could reduce their energy use more quickly in an initiative called the Race to Reduce. They dropped their collective carbon emissions so much that it amounted to taking more than 4,200 cars off of Toronto’s roads. In the process, they also saved 13.7 million Canadian dollars and were named one of 15 finalists out of 2,000 competitors for the 2015 Energy Globe World Awards. 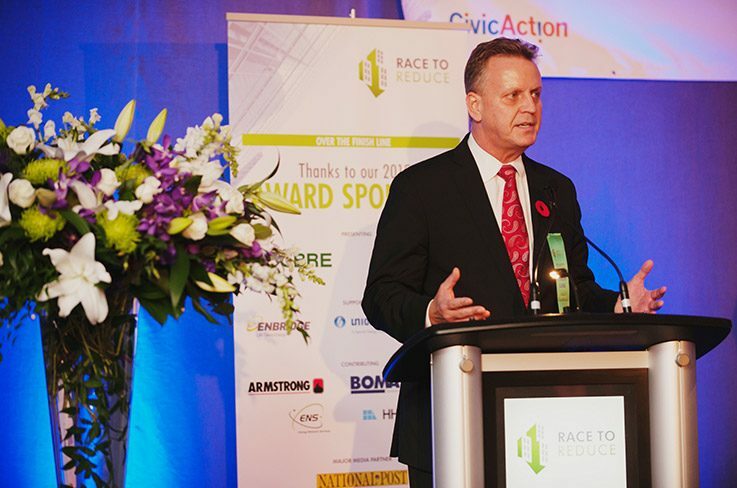 Back in 2011, when CivicAction, an organization that unites business and civic leaders to respond to social, economic and environmental challenges facing the Toronto area, launched the Race to Reduce, its leaders were uncertain about whether it would succeed. 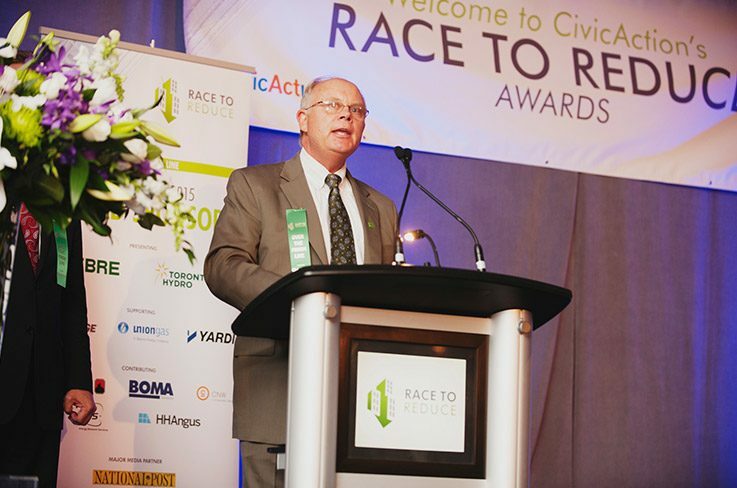 Some large landlords and big businesses were wary of the idea, explains Brad Henderson, co-chair of the leadership committee for the Race to Reduce. A few thought they were already doing their bit. Others anticipated – incorrectly – that it would cost more than it would save. “We were hopeful that our efforts would bring forth permanent behavioural changes … a different way of thinking about how people act and interact with their physical space and the energy that it consumes,”recalls Henderson. “That was a lofty goal.” Even so, it was clear that the initiative, one of the largest regional energy challenges in the world, could have a sizeable impact. A University of Toronto civil engineering professor estimated that office space accounted for one-fifth of the city’s carbon emissions at the time. 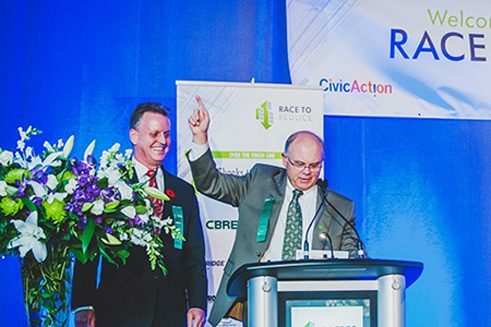 Henderson, who was senior managing regional director at the Toronto office of CBRE Limited, a real estate firm, was eager to take on the challenge. 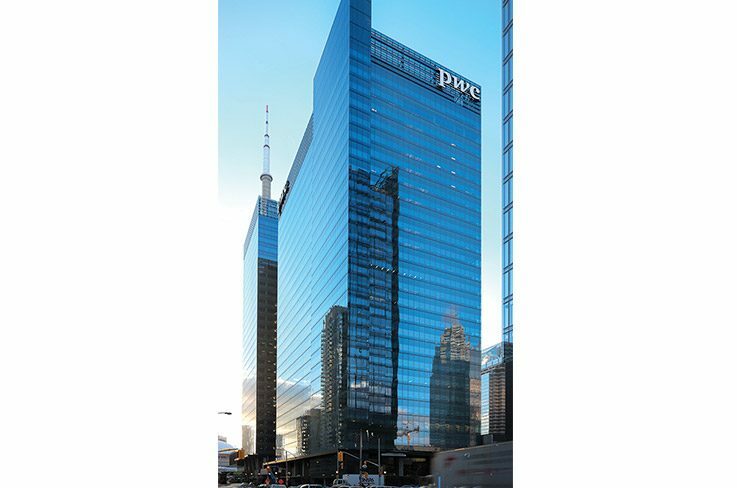 With the help of his leadership, the Race to Reduce, which aimed to lower total energy consumption in Toronto offices by 10 per cent between 2011 and 2014, swelled to include more than 196 buildings, accounting for more than 42 per cent of office space in Toronto. By the end of 2014, the Race had overshot its goal with the offices seeing a drop of 12.1 per cent, or close to 193 million ekWh, in collective energy use as compared to 2011. 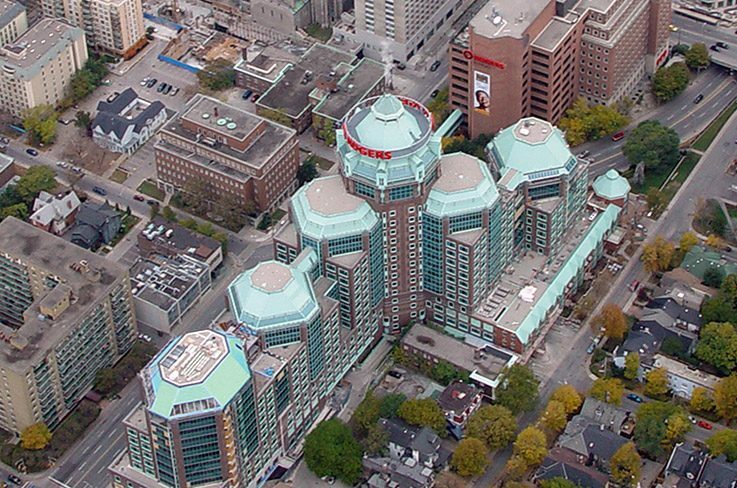 21 buildings reduced their energy use by more than 20 per cent with the City of Toronto’s Archives cutting its consumption by a whopping 59 per cent. At a time when countless environmental problems remain unsolved because the people affected by them don’t work together, the Race to Reduce succeeded because it brought diverse actors into what CivicAction calls a “neutral sandbox.” It worked to carry out the race in a space where senior executives and leaders from different sectors come together to work towards a common goal, but no one sits at the head of the table. 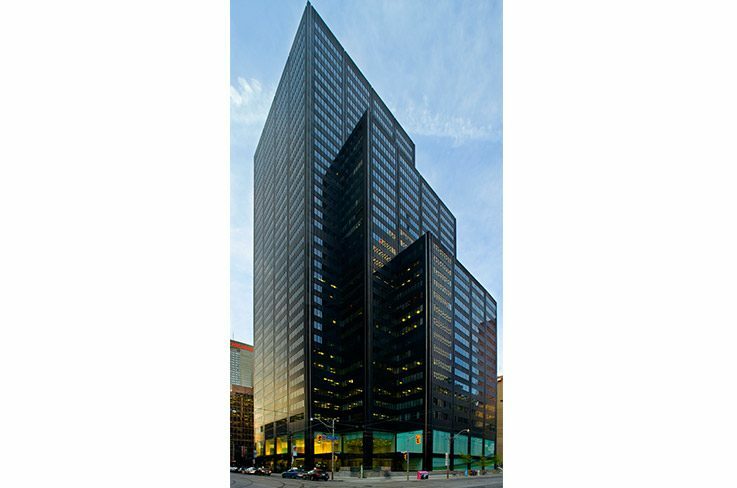 The banks, which lease swathes of office space in Toronto, pulled in their landlords and smaller tenants nearby. Different levels of government also came on board, while utility companies helped participants plan and shouldered some of the costs. Employees reminded one another to shut off lights and computers at the end of the day, as different businesses shared their tricks for cutting down on energy use with one another. 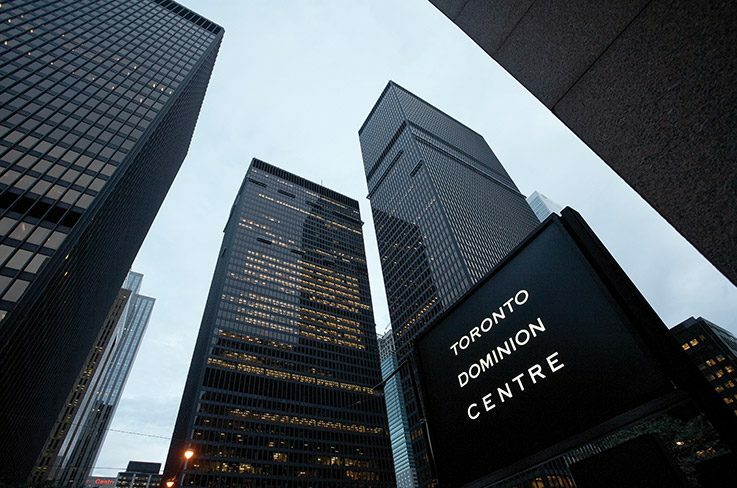 Large firms like TD, which spearheaded a tenant council with Cadillac Fairview, a real estate firm, also made their strategies available to smaller businesses with fewer resources. “We collectively got better at what we were doing,” explains Johnson. In fact, a survey conducted by CivicAction found that 62 per cent of the participants wouldn’t have made the changes they did if they hadn’t been involved in the Race. According to Palvetzian, collaboration between “the usual and unusual suspects” acted as a “trigger” for actions that would have otherwise fallen by the wayside. Now, the team is looking outward and sharing its resources with other Canadian cities, the Building Owners and Managers Association of Canada, and internationally. “Everybody has to be there and have their sleeves rolled up marching to the same goals,” Palvetzian says. 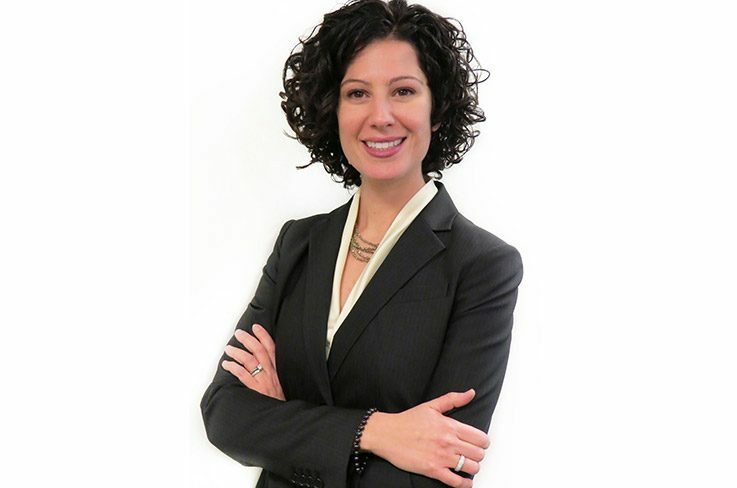 Alia Dharssi is a Canadian journalist who covers Canadian news and immigration issues for the National Post and the Calgary Herald, where she works as the 2016 Michelle Lang Fellow. She has also written about international development, business, urban affairs and human rights for the Guardian, the Thomson Reuters Foundation and VICE, among other publications.